The CJOB Beacon Weekend was a popular program feature during the 1970’s. You might remember the theme music, which was edited from a bosa nova tune. Take a listen. I grew up in Winnipeg and lived there for many years. During summer, Winnipeg people had a passion about cottages at the lake. And there were lots of lakes nearby. Whiteshell Provincial Park and Lake of the Woods was a few hours drive to the east. Riding Mountain National Park a similar distance to the west. And of course, Lake Winnipeg to the north with many beach communities. They say Manitoba has 100,000 lakes, but most aren’t as easy a commute as these. At CJOB, we knew that many if not most of our listeners left the city on summer weekends. Weekend traffic jams on the highways could often be worse than rush hour in the city. Starting in the 1950’s, many Manitobans built or bought cottages. Often, these remained in families for several generations. Those who didn’t own often rented the same place for a few weeks year after year. The rest of us knew someone we could visit. Additional weather information to supplement the Weather Office. We put in place a number of volunteer weather reporters, complete with their own weather stations, to provide our listeners with the latest conditions from all the key lakefront locations. Lots of details about weekend activities in the lake communities, such as festivals and sports events. And, of course, our highway traffic reports. Aircraft traffic reports were something new for Manitoba at the time. 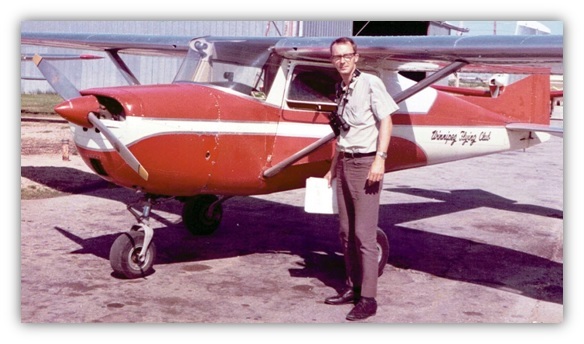 Our announcer Glen Miller happened to be an avid pilot who got his license in 1965. He was also active in the Winnipeg Flying Club. Together, Glen and the WFC pooled their efforts to cover the wide span of Manitoba’s lake commute highways. Beacon Weekend began Friday afternoon and ran until Sunday evening. Glen flew east, west and north to keep an eye on traffic for a few hours on Friday and Sunday. With construction and accident delays, there was always something to report. Our listeners knew what they were facing, and were better prepared for occasional detours. Glen used the Motorola PT Lunchbox Radio on our VHF channel, as well as a noise cancelling headset. With good elevation, his air-mobile had great range. As for me, I often said that the most relaxing way to spend a summer weekend was to stay in the city. It was almost empty! In the early to mid 1980s I listened to CJOB while I was a security guard. At approximately 6:10 PM on a Friday evening a loud & upbeat instrumental would blare across the lobby with the announcer proclaiming “This is Beacon for [year]! !” as the music continued. I wish I knew and heard that version (it’s not the Frank Sinatra tune on this link). Who was the announcer during these years?